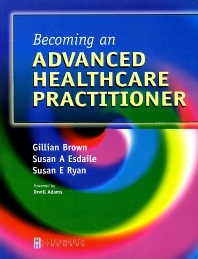 This text examines advanced practice in the health professions and the importance of evidence-based practice, continuing professional development, using theory to inform practice, being reflective, ethical, and organized, and proactively planning a career as an advanced practitioner. Chapter 1: Appreciating the big picture. You are part of it! The socio-political influences on health practice in the public and private sphere. Chapter 2: Developing competencies for advanced practice. How do I get there from here? Chapter 3: Integrating theory and practice. Using theory creatively to enhance professional practice. Chapter 4: Evidence-based practice. Informing practice and critically evaluating related research. Chapter 5: Enhancing reflective abilities. Interweaving reflection into practice. Chapter 6: Do you reason like a (health) professional? Chapter 7: Creating Scholarly Practice. Integrating and applying scholarship to practice. Chapter 8: Creating occupational practice. A multidisciplinary health focus. Chapter 9: Using adult education theories. Facilitating others' learning in professional practice settings. Chapter 10: Role models and mentors. Informal and formal ways to learn from exemplary practice. Chapter 11: The leading edge of competence. developing your potential for advanced practice. Chapter 12: Consultancy and Advanced Teaming. Promoting practice beyond the healthcare environment. Epilogue.